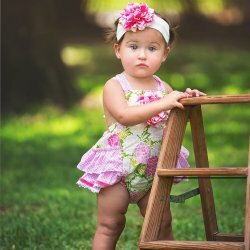 A simple and sweet newborn gown that's just perfect for your spring or summer time little gal. 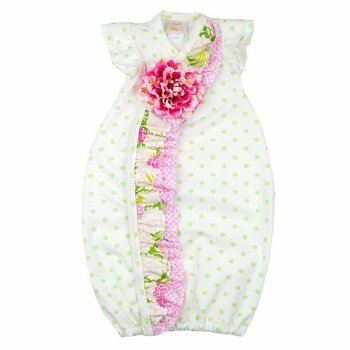 This "Summer Blooms" gown by Haute Baby features an ivory cotton gown with lime polka dots all over. 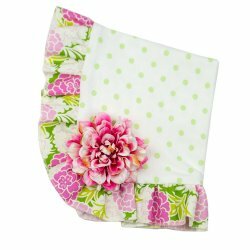 A vibrant ruffle in a pink and green floral print, that's coordinated with a pink geometric print, goes from neckline to hem covering all the snaps. 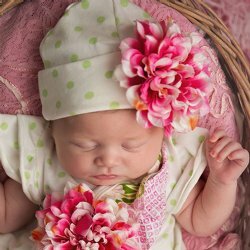 A beautiful bloom is the focal point and is easily removable for laundering and great to pin on another outfit as she gets older. 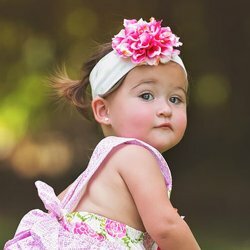 Just perfect for her Take Me Home outfit or for any special occasion. 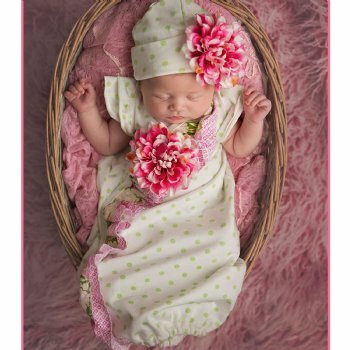 A great baby shower gift to add to her layette. Consider the cap or headband and blanket to complete the set.